Bacardi Gran Reserva Maestro de Ron Rum Review the! A Premium Sipping Rum isn’t really a big deal anymore. You could probably spend most of your life trying every premium sipper and never get close to trying them all. However, what hasn’t really been done before is a white sipping rum. Whilst the casual rum drinker may consider Bacardi Superior to be a premium white rum, in terms of sipping it doesn’t even come close to the kind of smoothness and complexity that befits a true sipping rum. So far I haven’t seen another review (I’ve seen press releases) of this new offering from Bacardi. Whilst I won’t proclaim to be the first to appraise this rum I haven’t seen this rum featured on any other blogs to date (19/07/14). I could almost claim an exclusive on this rum review…. The presentation of the Gran Reserva pays homage to the companies flagship rum – the Bacardi White Superior. Same green tinged thick glass bottle. The customary red Bacardi bat logo. However, unlike the Bacardi Superior this bat is presented as a plastic badge set back slightly from the bottle in its own little alcove. This adds a touch of class. As does the vintage labelling (as pictured). The presentation of the rum is excellent. It is immediately recognisable as a Bacardi product but it is also very apparent that this is something a little more special. The Gran Reserva is currently only available at World Travel Outlets (Duty Free to you and me). So it is currently a limited release. In the UK Duty Free shops the rum is £36.99 for a 1 litre bottle. For a Premium Sipper this is a very competitive price. When it is introduced to the UK market I would expect to pay at least that for a 70cl bottle. The rum is bottled at 40% abv. The presentation of the rum reiterates that is intended as a Premium Sipping Rum. It is filtered through Coconut Shell Charcoal (I have no idea what this is). The rum has a wooden topped synthetic cork enclosure which is as good as any I have seen to date. It is big and gives a very satisfying “pop” when the bottle is opened. It also has a picture of (whom I presume) is the legendary Facundo Bacardi.Overall the presentation of this rum is really very beautiful, eyecatching and mightly impressive. I haven’t drank a great deal of White Rum. Chairmans Reserve White Label and Bacardi Superior are the only “brands” that come immediately to mind. I have drank quite a bit of supermarket white rum but nothing beyond that. This is not due to any real snobbery towards white rum – I just haven’t seen any which has really appealed to me. This is the first white rum that I’ve thought “I’ve got to try some of that!”. I would imagine that the rise of Premium Vodkas such as Grey Goose and Belvedere over the past few years have made Bacardi consider a premium white sipping rum. 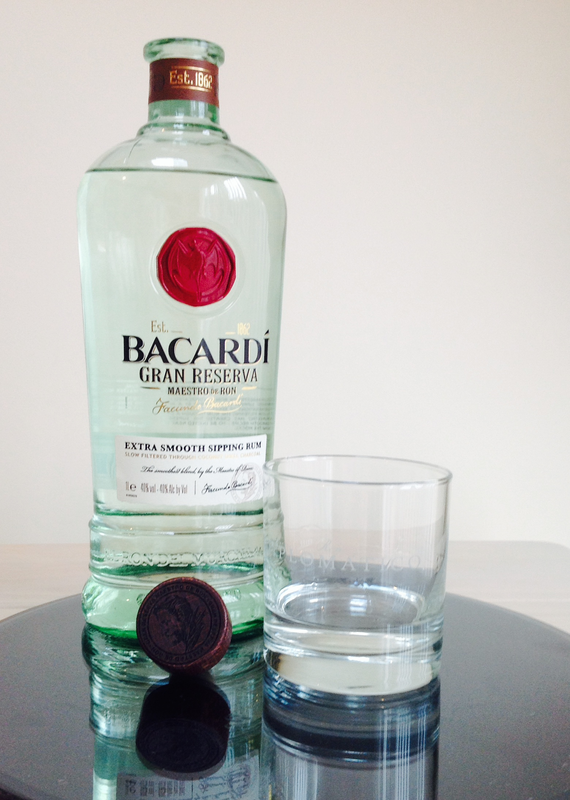 Bacardi Superior is often a ready and more flavourful replacement for vodka in cocktails so it makes sense that this enjoyed neat could appeal to both rum and vodka drinkers. From what information I have been able to source the rum in the blend is aged for around 3 years. Compared to other sipping rums this isn’t very long. It would seem that this Coconut Charcoal Filtration must really do the business in removing any unpleasantness. Unlike Bacardi 8 this is not from the Bahamas plant. It is from the Puerto Rican operation which produces the majority of Bacardi’s rum. As I was also able to get a bottle of Bacardi Superior at a very good price when in the Duty Free, I can make a comparison. This is mainly to determine if the Gran Reserva is noticeably better than its more popular older brother. So first up is the nose. When poured into the glass the Gran Reserva is noticeably thicker than the Superior. Rightly or wrongly this gives me the impression of a better rum. The nose is very fruity and sweet. If you are a big Bacardi Superior drinker then you will immediately recognise this as Bacardi. Scents of Apple, White Grape and Orange lead the way with very little in the way of ageing in terms of oak or spiciness. In many ways I was expecting to get a more premium Bacardi Superior experience and this is definitely what this delivers. There is little in the way of alcohol coming through the nose, the fruits are much more intense. Bacardi have labelled this a white sipping rum. This has causes a bit of a stir in the rum community. I’ve no doubt this is entirely intentional. Other producers are looking towards more premium white rums but few have the clout of Bacardi. So on with the sipping. As you pour the glass you notice immediately that this rum is quite viscous and clings to the side of the glass. It is (despite the Georgian glass bottle) almost entirely clear. The initial sip is very sweet and intense. It is certainly very different to any other sipping rum I have tried. For those familiar with a Bacardi and Coke its very much like a more intense version of that. All in a tiny sip. I can definitely see this converting a few vodka sippers but many rum enthusiasts will not appreciate what Bacardi are trying to do with this rum. Unlike the Superior this rum is ridiculously smooth and clean. It almost coats the throat on the way down. I’ve chilled this rum in the freezer for a couple of hours and compared alongside a Belvedere vodka it wins for me. The rum is smooth and clean. It is sweet and fruity, citrus and green apple flavours. As is the way I have mixed the rum with cola. However, once mixed the rum is really not noticeably better than the Bacardi Superior. I feel that this rum is one which is best enjoyed ice cold. Either with an ice cube or left in the freezer to chill. It is a bit of a waste to mix this rum when it is so smooth and you can get roughly the same flavour profile from the Bacardi Superior. I’ve no doubt that once again this is a rum that will be bashed by the rum snobs. Again as far as I am concerned this is something different. If you want to drink the same rum, in the same drink then why bother experimenting? Why like such a diverse spirit as rum? Just go back to your local store and buy a bottle of the same old. This is a premium white sipping rum and must be accepted as that. It isn’t made to compete with Zacapa or Diplomatico it is a completely different rum. There is no oak or spice its just a very clean white rum. I doubt Bacardi will like this but it might just work beautifully in a Mojito or Daiquiri. Only on special occasions though. There are a couple of independent stores in Germany that have a good selection. So much rum to try it can be hard to know what to try next. This rum has his the American stores. The bottle looks much better. It also clearly states the age. 1 year aged in white oak then blended. It is then aged another 3 months in white oak and bottled.